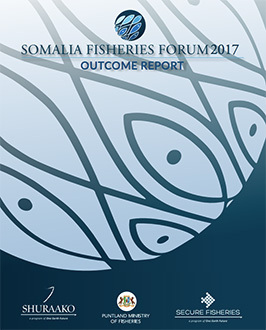 The Somalia Fisheries Forum was co-hosted by the One Earth Future programs Secure Fisheries and Shuraako and the Puntland Ministry of Fisheries on October 24–26, 2017. Approximately 600 participants attended from across Somalia and the international community contributed to fruitful discussion about challenges and opportunities for the Somali fisheries sector. The forum commenced with important commitments to improving the fisheries sector made by the Somali deputy minister of fisheries and marine resources and regional member states’ ministers of fisheries and marine resources. This report includes event details and outcomes and provides key findings and recommendations.